A recent Microsoft event known as “the future shop”, was designed to provide a place where retailers could come and see how artificial intelligence (AI) is shaping the future of the trade landscape. Microsoft’s key partners, including Geomant participated at this event and demonstrated the benefits of modern technology. How can AI make everything work a little faster, smoother, and more predictably? This was the question that speakers and exhibitors addressed. The aim was for all visitors to have a clear idea of how digital transformation can shape the future of their businesses by the end of the day. Our colleagues who attended the event were happy to tell us about their experiences and this blog provides a summary of the day. What did you think to the event? The idea of Microsoft providing a forum for their partners to meet potential customers is, in my opinion, a very good initiative that invites demand and supply into a common place where we can meet in an informal and interactive way. It was good to meet several potential customers and partners in person at the same time. Here we had the opportunity to showcase the most important features of our solutions/products and not only to demonstrate them on the screens placed on our booth, but also to let the visitors try them out themselves too. Which lectures did you like best and why? What thoughts did you consider useful and informative? There were a lot of good and useful presentations during the day, and we were able to join in on a couple when we weren’t talking to visitors at our booth. Several domestic and foreign commercial chains, such as Auchan, Tesco, Praktiker and Polish Zabka, presented existing or under development digital solutions that meet the needs of modern consumers. For example, in the case of online stores, we heard of intelligent product search solutions that allow the customer to find a suitable product that they are looking for as soon as possible. In addition, with the help of artificial intelligence, they try to increase the value of the shopping basket with product recommendations that match the consumer's search, shopping history and shopping habits. What was the most important innovation around which most exhibitors demonstrated their solutions? One of the most appealing innovative solutions for me was an application that aims to stop queuing time. It works by letting a customer join a queue from an app on their mobile phone, the customers place is then virtually held in the queue so they can go about there shopping being notified when it’s time to make their way to the checkout. What did Geomant demonstrate and how? There were 3 screens at our booth. The first one showed our new Geomant website with messages that visitors wrote to our chatbot ‘GEMMA’ - we were able to watch the bot’s answers live. The other screen demonstrated the process of the client/agent, who handled the questions that the chatbot was unable to answer, and also the situations where the visitors asked to chat to a real administrator. On the third screen of the booth, we showed a demo video of our retail bot in a real-life situation. We found that the video attracted the audience, who then wanted to try the solution themselves. Geomant has introduced an intelligent retail chatbot that can benefit online retail stores. The bot can answer the most common questions of customers, e.g. about delivery deadlines or how to replace a defective product. But that's not all, if someone tells the bot, "I'm looking for a Huawei mobile phone for under $100,000," then the bot will look in the online product catalogue for something that meets that criteria and then displays options with pictures, descriptions, and prices. Customers can easily see what’s on offer along with the key information they need and can instantly order via the chat interface. 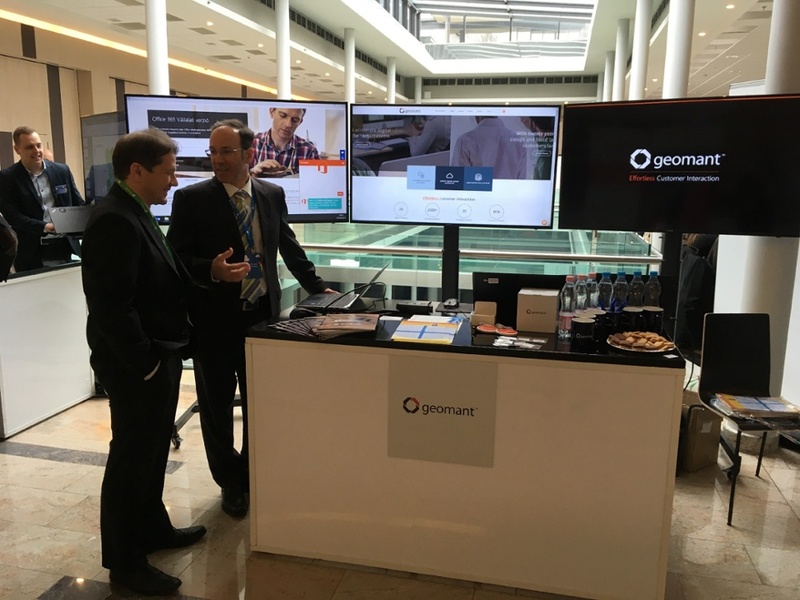 How successful do you think the demonstration of Geomant's booth was and why? Fortunately, our booth had great interest at the event, not only because the 3 screens proved to be spectacular, but also because everyone was happy to try AI. Those who were interested in the interactive features after that often wanted to talk about the technical details, and most people were clearly engaged in the process of training the chatbot and possibly integrating it into the company processes. So we had lot of productive conversation about the demonstration and about our AI solutions. We are happy to have had an opportunity to have such direct and personal meetings between potential customers and Microsoft partners, so we are very grateful to Microsoft for inviting us to this event. Anyone who missed this event but is interested in our solutions or would like to try them out, should contact us with confidence. Or if you’d just like to find out some more information on bot’s here’s a couple of blogs that you might find useful.